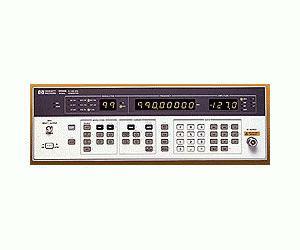 The Agilent 8656B is a programmable synthesized signal generator that combines performance, quality, and economy, covering the 0.1 to 990 MHz frequency range. Offering ±1 dB level accuracy and 0.1 dB resolution with calibrated output levels over the +13 to -127 dBm range, the Agilent 8656B provides precise output control. In addition, its modulation capabilities include simultaneous and mixed modulation modes from internal (400 Hz and 1 KHz tones) and external sources. These features create a versatile signal generator, for use in a variety if applications.